Whatever today's outcome in the stand-off between Fine Gael and Fianna Fáíl over the controversy surrounding the Tánaiste Frances Fitzgerald, there must be no delay in, or backtracking on, holding a referendum on the Eighth Amendment. This is the view of the Galway Pro-Choice group, which also says that despite the current political uncertainty, the work of the Committee on the Eighth Amendment of the Constitution must continue. “This issue is much bigger than any one government or party and political uncertainty is no reason to delay the Referendum on the Eighth Amendment," said Suzi Coombs of Galway Pro-Choice. 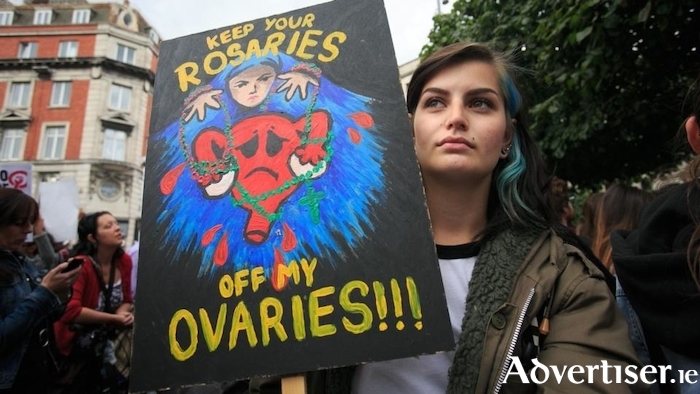 "Twelve Irish women a day travel to the UK for an abortion and countless others take illegal abortion pills at home. Whatever party is in power by the end of the year is of little relevance to these women. We as a country are ready for change and this cannot be delayed any longer." Earlier this year, An Taoiseach, Leo Varadkar, announced a referendum would take place in May/June 2018 on the Eighth Amendment, resulting in Pro-Choice campaign groups working to encourage people to get registered to vote in the upcoming Referendum. “We would encourage people to still get registered as we are acting in good faith that the work of the Oireachtas Committee and the referendum will still go ahead," said Ms Coombs. Though the official deadline to register to vote passed on November 25, there is still time to register via the RFA2 which is available to download from www.checktheregister.ie, and is also available from the Galway city and county councils. This form is relevant for those who have missed the deadline to register, are turning 18 in the coming months, or who wish to register a new address.